The story of 'Casino Royale' revolves, in many ways, around the definition (or “redefinition”) of James Bond’s identity. As a faithful 21st century adaptation of Ian Fleming’s first novel that was published in 1953, the 2006 film introduces us to a British agent promoted to the 00-status within MI6, a code assigned to those who have what it takes to terminate someone in cold blood. His first mission with the code number 007 will see him face him off against Le Chiffre, a banker of the world terrorism who has been betting his clients’ funds on the stock market. 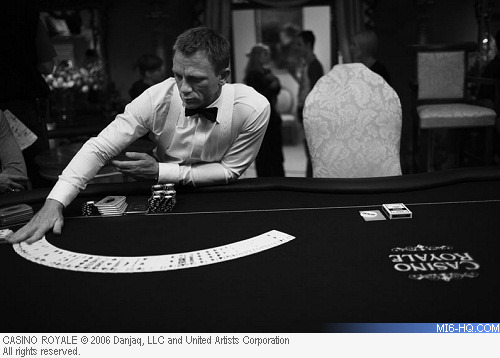 Bond simply has to beat this man at a poker tournament at the Casino Royale in Montenegro. Director Martin Campbell, with screenwriters Neal Purvis, Robert Wade and Paul Haggis, gave the audience a thrilling story taking place in exotic locations like Miami, Madagascar, Montenegro and Venice – the places where James Bond will fight, gamble and love. James Bond, whom we knew from 20 previous adventures, is now portrayed by Daniel Craig and –since ‘Casino Royale’ is the first Bond book, we have here a redefinition of the Bond persona if we compare him with the previous five actors who played him. Throughout 2006, Craig refused to say the classic “Bond, James Bond” introduction in press conferences or interviews. None of the trailers had him speaking the line either, unlike Pierce Brosnan’s debut in 'GoldenEye' (also directed by Campbell) where every promotion wanted to establish him as the James Bond we always knew. The promotional campaign only reminded us that he was James Bond simply because of the improvised gun barrel sequence and the use of a choral version of the James Bond Theme by Pfeifer Broz during a teaser trailer that finished with a cold look of the new 007 giving a glance to the audience, as he sat on a casino table. 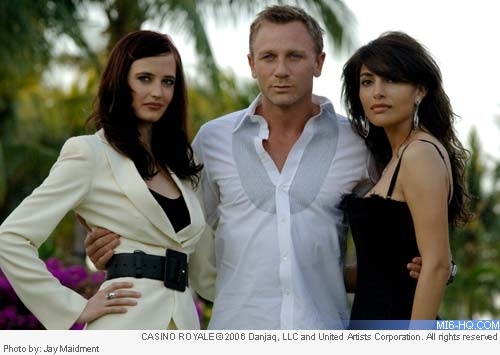 If we take a look at the history of 'Casino Royale' and its complicated transition to the big screen, we can see there were big conflicts around the identity of James Bond in the many productions that took place since the book was published. First of all, there was a 1954 TV adaptation for the CBS, who offered Ian Fleming around $1,000 USD to adapt his novel as an episode for the ‘Climax’ series. Peter Lorre and Linda Christian were cast as the villain and the girl (renamed Valerie Mathis) and Bond was turned into a CIA agent played by an American actor named Barry Nelson. The production was relatively close to the novel, yet the true identity of James Bond was missing: all the visual splendor of the cinematic productions that EON Productions (Albert R Broccoli and Harry Saltzman) would make years later was reduced to a number of interiors and the protagonist looked more of a nightclub gambler who lacked the depth of the literary 007. The tragic relationship between the hero and his female counterpart Vesper Lynd, a key element of this story, was also avoided until a romantic kiss that closes the show. In 1967, producer Charles K Feldman –unable to join Broccoli and Saltzman– decided to turn his rights of the novel he got at the beginning of the decade into an extravagant spy spoof, where money was thrown out of the window and featured a retired Sir James Bond (David Niven, one of Ian Fleming’s choices for the role) who hired a number of men and women he renamed “James Bond 007” to fight a mysterious enemy who has been systematically murdering British, American, French and Russian agents. There’s no need to say that even when Peter Sellers introduces himself in the “Bond, James Bond” fashion, there’s actually no James Bond in a story where everyone (well, almost everyone) ended up playing harps in heaven. EON Productions got hold of the rights to the book shortly after the release of 2002’s 'Die Another Day'. Barbara Broccoli phoned screenwriters Purvis & Wade with a very clear order: “Leave everything you’re doing and start reading ‘Casino Royale’”. All of these events lead to the production process for Bond 21: Pierce Brosnan laid off the role of 007; Martin Campbell hired once again as the director; and the casting of Daniel Craig as James Bond. By February 2006, the rest of the cast was announced: Eva Green as Vesper, Mads Mikkelsen as Le Chiffre and Giancarlo Giannini as Mathis. 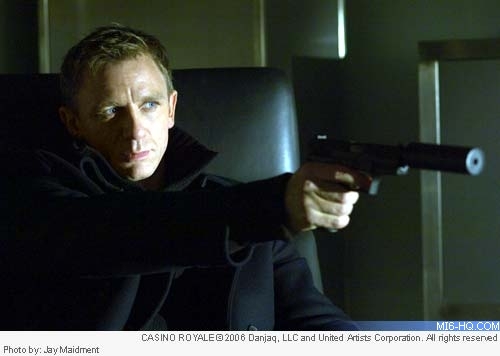 In the 2006 movie, there is also a small issue with the identity of James Bond. Primarily, because the story is set in a way that the viewer could progressively discover his identity. For that reason, the film’s many TV spots invited us to “see how James became Bond”.